Below is a list of active guilds in Ashen Empires. You can also view the Top 25 Guilds by experience on the Statistics page. The information in this list is provided on a volunteer basis by guilds, so there may be more guilds than those listed here. If you would like to add or change your guild's information please post in this forum thread or contact GM FujiQ by PM or email. "We do a lot of hunting/Guild Hunts and skills. Many lvl 100+ Players. We don't take anything too seriously. There is no level Reg to join - we just ask that there is no begging for items!! If you need something then ask. "Ave is a very tight knit guild that has only had 1 member ever leave and none kicked out. Dedicated to its own and those of good heart, we have a long running and trusted reputation on the server. Unfortunately, our active numbers have dwindled as time has passed." Motto: "Once a BoF, always a BoF"
"BoF is a neutral guild founded by Minas around May 2005. We have no other agenda other than friendship and fun. We have no leader and no rules. Many of us have known each other for 4 years or more and alot of us will probably be life long friends. BoF is famous for our crazy antics, our shadowy connections, and our hawt chicks." Motto: "We will prevail, where Talazar failed....until it is finished!" "The story of The Chosen Twelve is linked to both King Lotor and Talazar. 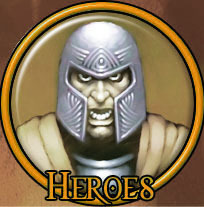 Lotor chose twelve of his greatests warriors, Talazar among them, to destroy the rune artifacts. This quest given by King Lotor has gone unfulfilled, and The Chosen Twelve have learned that is their destiny to complete. The Chosen Twelve all share strange markings upon their arms, and they have all have been drawn to each other by a Guiding Light. The Chosen Twelve have picked up the quest of King Lotor and will complete it. As a guild, we in CXII enjoy all the facets the game has to offer. From Player vs Player combat and End Game boss hunts, to crafting and Role Playing. We enjoy being active in all the aspects of playing a MMORPG, and what being in a guild adds to that experience." Motto: "Once a COW, always a COW." "The Dark Covenant was one of the most powerful evil guilds on the Heroes server before the DS update, and are all decedents of The Minions of Talazar from my former command over his army on The Sanctuary Server. Dark went inactive due to reality taking up most of the time of their leader. But we have returned. We'll be focused on rebuilding our structure of loyal soldiers until year end. Preparation is everything and we have quite a few things to focus on due to the changes made over the last couple of years." Motto: "Madness? This is Sparta!!" "Death To All is a PK guild founded in 2001 by Panchos II. They are the current longest running criminal guild on the server." "The guild was created by Colebert and Meatwad. 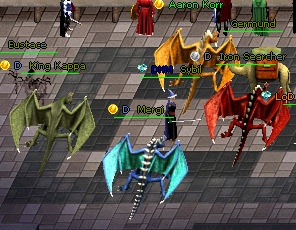 We are a group of friends who enjoy hunting dragons and pvping together. We are continuing to become stronger so be on the lookout of a green D tag =). When we are all on, we are a very strong force that cannot be reckoned with!!" Motto: "Be loyal, be fair, be respectful and helpful to others, and above all, just have fun." "Leaders = The Mighty Samson and Lady Samson. This guild is about helping other people to have fun and get the most out of AE. We range from very powerful skilled players lvl 110, to new players. We aren't about levels, we are about good hearted, respectful people. We are like one big happy family." Motto: "May the Dragon Spirits Guide you on your Journies"
Motto: "We're not drunk and lost. We're exploring." "DNM is a neutral guild that was created in early 2001 by Jeff Rogers. 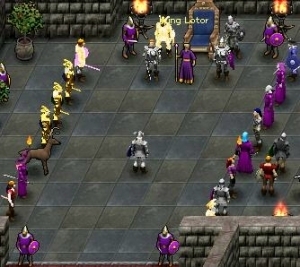 The guild is formed of experienced veteran players who have been in the guild for years. The guild has never taken sides between good and evil. DNM honors its allies and helps them with all it can. The main goal of DNM is to provide a good environment that allows the members to have fun and hopefully, sail the seas of Dransik someday. 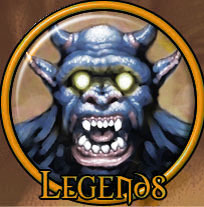 The guild is on both Heroes and Legends but it is mainly active on Legends." "We do a lot of different hunts. We go to the Northern Frost Giant Island, Hell, Artraxis the Elder, and Ghouls for Yesoth. 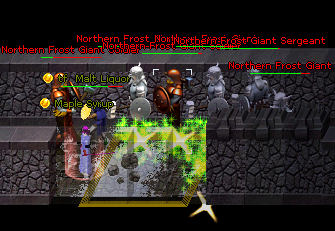 We also do hunts for lower-levels like Valekars Fortress, King Mack Mack, and Proudbloods. We dont take anything too seriously. If we get a drop and you want it, feel free to ask. There is no level req, no other requirements. The Factory is just a small guild on the rise." Motto: "We will help anyone.... just ask." WE ARE STRONG, DETERMINED AND TENACIOUS! WE ARE CONQUERORS, WARRIORS AND BATTLEMAGES! UNITED TOGETHER WE ARE A POWERFUL FORCE TO BE RECKONED WITH! WE WILL STAND THE TEST OF TIME ON WHATEVER JOURNEYS WE WILL TRAVEL! "H was originally started on Primordia by 8890(Numbers) and Agent 101. When Sanctuary server came on line Konman (an original member) restarted the guild there. H guild has been continuously active since that time. Upon Kon's departure Majaesta took over and soon recruited Manaiho the Mute to help with this task as co-leader. We also have the help of a council. We consider ourselves a divine-neutral guild and ask only one thing of our members and that is their loyalty. Our guild consists mainly of adults and the preferred age is 20+." Motto: "Rise against Evil...Craft the world in your image. Honor to the death." "Founded at the fall of Knights of Honor in July 2004, Imperial Order sprang from the chaos of so many people left with no word to their fate by the leader. Crafters, hunters, specializing in melee, bow, and especially crafting. It's a family environment facilitated by some rules that help maintain that balance. Mostly we're friends helping one another and whoever else that looks like they need it." Motto: "Never be satisfied; for you will grow stagnant and lethargic. Strive always for growth and perfection." "The Ivory Serpent Society is a brand new guild that will be built from the core out. Dedication, respect, and trust are of utmost importance. The guild's leader is a person known for high standards and steadfast opinion and beleif. Though small in the present day, and not willing to rush growth by letting in wild card elements, the guild will grow in time, as trustworthy friends find their way to their calling under the Ivory Serpent. The guild's standards place little importance on alignment, and great importance on aspects such as dedication, trustworthiness, and the dignity to compose oneself in a mature way towards the community and in general. It may never be an army, but it may possibly be as difficult to get into for some as a private club, so S is to be very tight-knit." Motto: "Know thy trade. Honor thy trade." "Guild does not recruit. Members must apply to show dedication to want to join. See information on website." Motto: "NO RULES, NO RANKS, NO BS WEBSITE"
"LVM is unique amongst AE Guilds in that it is a democracy, run by the members. All decisions are done by consultation with members, even down to whos gets tagged and who gets booted - everyones voice counts in LVM. We are a family, rather than a guild, and the theme of the guild is to help members help themselves, and we believe we are the finest trade skilling and new player guild on the server." #1. No grief play. This includes vulching, looting (unless done for appropriate reasons), or scamming of any form. Begging other players is also prohibited. #4. Do not use foul or inappropriate language in guild chat or towards other players ingame. If some members would like to talk or joke about certain subjects that may offend other members, please use 'tell' or 'party' chat to do so; or ask if it is okay in guild chat. #5. Think of the image of LoD. Be respectful and honest to everyone. Whether it be on a hunt, trading, or just talking to other players. Use common sense." Motto: "My word is my honour, my honour is my life"
The Lotorian Knights, being the oldest roleplaying guild, is full of tradition and caters to the mature player. Good conversations and the ambition to go beyond the simple goals of helping friends and accumulating wealth offer a distinctive level of diversity. As Champions of King Lotor, we are the natural enemy of the Minions of Talazar - no matter which form they take. We remain a roleplaying guild at heart, yet will not attempt to force this onto anyone we interact with. However, we will make it a point to defend those that share views akin to our own, if necessary by taking up arms." "We usually like to try to help newer players get settled into the game. We are all about having fun, and we don't usually 'grind.' We do things as a group and usually enjoy each other's company." Motto: "It's what we do." 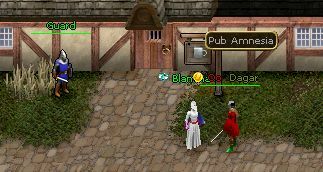 "PIMP is a guild that was started by a bunch of friends that decided to leave an inactive guild, but wanted to stay tight. We are a nuetral guild. We hold frequent guild hunts, and generally assist each other with as much as we can (quests, items, you name it). We like to have fun, and joke around alot." "We are an anti-pk guild and we help new players to level. We have many allies and many enemies. We enjoy hunting and questing to help the guild members." Motto: "We see no wrong, we see no right, we see between the black and white...Shades of Gray"
"Shades of Gray is the oldest continually running Guild on Heroes Server. We are very unique among the guilds in AE and are a neutral chaotic guild that is led by a council of lifelong members. We are all very close, and call eachother 'family.' If you are intrigued by the mystery of our ways, please visit http://www.steintech.com/sog for more information or an application to join." "Society of the Black Rose started on KI with only 1 member, then grew to 35 or so active members during the TKO Beta period. Membership dropped back to 20 or so during PtP." "'Templum Veritae' translates to Temple of Truth. We are followers of Isos, God of light, and make our home in Parian's Temple...though it is not uncommon to see one of our members far from home. Our motto, "Veritas Vincit", means "truth conquers". The light of Isos cuts through all deceit and lies. Our guild is like a family; we are all very close friends. An attack on a member is an attack on the whole, and we treat these actions as such. In game we role-play some and power level some... but above all we have fun and care for one another." Motto: "Chop! Mine! Spin! Weave! Plant! And work as a group!" "We are not a guild game-wise (no guild-deed, no guild-chat, no guild-tag), although our members almost act like a guild (and yes, we DO have a ucod-channel). UCOD was created by Faelan Kiarnan of the Templars and Succubus of the Lotorian Knights, UCOD is a loose union of crafters who work together and help each other out whenever necessary. Our members have different skills in different trades, and in an common effort, we are aiming to be the best crafters and most-trusted salesmen on Heroes server, guaranteeing fair prices for resources, etc. We have people of different alignment (Divines, Neutrals and Pkers), but we do not tolerate scammers and beggars." Motto: "Always act with Honor"
"WoH is a neutral guild. We are ruled by a council. Council members are elected by the Guild members. See our rules in our guild thread. We are invite only. If you wish to join WoH you must be invited by a current member. Get to know us and you might just get an invitation."